De Trondhjæmske Tusenknusere are making our own rules (yes, I know – stealing rules all over the place and calling them ours, it’s more or less the same, right?). 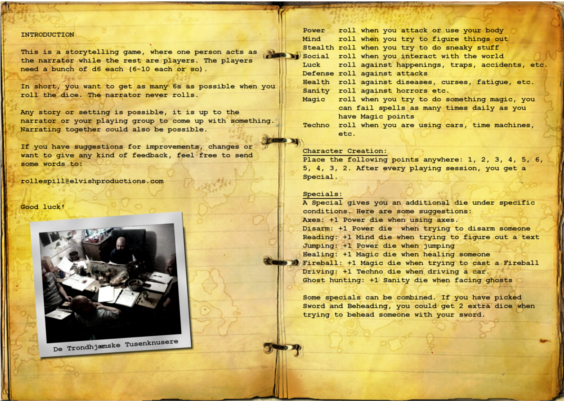 Here is a rules light version rpg, only 3 pages of reading material. Feel free to try this and give some feedback on your experience/thoughts either here or to the email address in the pdf. It hasn’t been playtested much yet. In its current form it has so far survived an evening with 5 players aged 3, 8, 8, 12 and 38. They all had fun, so at least that was promising.